So why should you donate? Well, I don't claim that you necessarily should, but I will share with you why I am choosing them as one of the recipients of my donations for #GivingTuesday. I owe a lot to my success as an adult to the SSU Honors Program. When I entered Salem State, I had an inkling that I would do well and find my way, but it was the Honors Program that was the guiding light that both helped and pushed me to do things beyond "just get an education" which, as a commuter student, is often how we viewed going to Salem State. Beyond just more rigorous courses, the Honors Program provided a community and opportunities for students to take part in that enhanced my experience every year of the program. The program and its leadership encouraged students to grow in ways they might not have previously conceived of themselves growing. 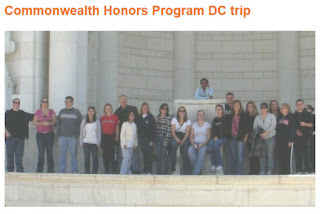 One way they did this was through supporting students in travelling to different opportunities to present and meet other students in Honors Programs across the country. In my first year, I applied to present at such an event, a regional Honors Program conference in Washington D.C. In total, I believe there was about eight of us who were attending and presenting. It was indeed my first conference and my first exposure to any kind of academic conference. It was scaring (first time presenting to a roomful of students and adults), inspiring (getting through said presentation), exciting (meeting other students from around the country also excited about learning to some degree), and fun (spending time both at the conference and in D.C.). In fact, one of the more exciting things that I recall was that I got to visit the Smithsonian while they were still hosting the Star Wars: The Magic of Myth exhibit. In total, it was a great experience and I am still friends with several of the other students that I went on the trip with. As importantly, it inspired me to do these kind of events more often. Thus, throughout my college years, I presented at such conferences at least once if not upwards of six times a year at many local, regional, and national conferences. That made such a gigantic difference in my learning and development. It played a key role in eventually becoming an educator and even in presenting at dozens of conferences sense. So when I look back at my experience at Salem State University, the Honors Program, and the impact such trips had on my adult and professional life, it is palpable. Such opportunities strongly contributed to who I am today and I'm compelled to make sure to give back so that others have such opportunities as well. I hope this encourages you to possibly donate to the Honors Program, but if not, I hope you'll still consider giving something to some charity that you feel is worthy of your money.